The New Living Translation® provides a wonderful balance of readability and authority. It is easy to understand, poetically beautiful, powerful, and emotive. At the same time, due to the careful work of ninety leading Bible scholars, it is accurate to the original Greek and Hebrew texts. The NLT® helps make the Bible accessible, useful, and enjoyable for every situation. The easy-to-read, clear text is perfect for comparative study of difficult passages. This edition of the NLT® is the latest version and includes the 2015 edits made by the publisher. This translation fits well with study suggested for a yearly trip through the bible, It is clear and well presented to make it easily read. I use it in conjunction with the study notes. I often compare it with the Life Recovery Bible to help with addiction recovery. The transliteration is easy to read and, in my view, expresses the emotions of God rather than a direct translation from the original language/s. It is a valuable addition in understanding the original meaning of the word or phrase. I love the way I can add versions and then compare a verse on them. Very helpful to me when doing Bible Studies and more! Integrated well with the Esword. I love my eSword Bible! I just add NLT version to it for additional study reference and it has been a great addition. I use a half dozen translations to present a differing, or expansive view of a passage and the NLT is one of them. Like in photography when you move to capture an image that is from a different perspective, the NLT allows you to use language that fleshes out, or uses words that doesn't have an already established mindset in my hearers. As a new pastor, it is always fun to get people to see something common through "new" eyes and the NLT helps me to do that. Like any other translation, one has to watch the word usage, especially the verbs, and I like generally what I see in this one. It is a good tool for the toolbox! Easy enough to download and install in e-Sword. I actually purchased it for use with the Sword library, assuming they were using the same technology, and they're not; if you need Sword libraries and not e-Sword, you'll have to look elsewhere (and "where" I do not know.) But: for e-Sword, installation was easy, efficient, effective. Delivery took a little bit, but not so long that it was a surprise; following the instructions for installation worked without a problem, and it looks like it's the NLT. I find the NLT to be very helpful during my Bible studies. Our pastor has been using the NLT version and after my personal research of the NLT version, I decided to get the e-Sword edition so I can use it preparing my study's. It is much handier to be able to compare the NLT with KJV, NKJV, ISV, and all of the other versions - all within e-Sword, then print out my condensed study for sharing. The e-sword study series is a real blessing in Biblical preparation for teaching & preaching as well as personal study. To have several translations of the Bible available instantly, at my fingertips, is awesome! As I continue to use e-Sword, getting to know the amazing things I can do from either my phone or iPad, I am so thankful for the techno world. Never thought I would say that, but it is true. All the years working (and sometimes fighting) the coming of the computer into the business world, has been a blessing in my retirement years. Just a little patience can provide a wonderful world of information, which makes my study of the Bible and the teachings of Jesus all the more blessed. I have read through the NLT several times now and really appreciate the rigorous translation, footnotes, and current American English language. I would recommend it to anybody who reads English and is interested in the Bible. The footnotes are the best I have seen in any of the better English translations of the Bible. I have used e-Sword for many years and recommend it to my friends. I have chosen it over a different Bible program which cost me over $100.00. I like the NLT version of the Bible. I like studying the Bible. I love reading the new translation. I own multiple versions of the Holy Bible and enjoy comparing the differences for the sake of learning the background and improving my comprehension of the original intent of the messages. Before I received my first copy of E-Sword, I used to do all research manually in paper copies,which I still use for comparison. The computer is much faster with cross-referrals. That allows me more time to meditate on the real meaning behind the words. Great translation for my studies! I learned about the NLT recently when I ordered Chuck Swindols Study Bible. It is over the top for a Study Bible, so I knew I wanted it as part of my eSword and Logos Collections. I love using different versions of the Bible. NLT is one of my favorites. The version is an easy read, and a lot of it is well written for todays English, unfortunately there are portions that make me shudder because of their lack of understanding when translating and for that reason I would not recommend it as a primary version of the Bible. I'm not sure how to say this, but it is as if doctrine over rode the a direct translation. Yet the clarity of the Word came through in most areas. This is an excellent translation that speaks to me like no other; I wish I had started using it years ago. I find the Psalms particularly powerful and reverent. I bought a hardcopy of Tyndale's NLT Catholic Edition and would be very grateful if this software was also available with the Deuterocanonical books. Often, the NLT version [2007 or 2013 or 2015 which is this particular resource] brings out the meaning of a verse with greater clarity. A handy resource to have when comparing translations. It’s too bad the NLT doesn’t come with the footnotes I am used to in my other Bible app. They are very important for revealing what the original languages say. ESwordis the best resources out thereto help you study, prepare messages, and go deeper in GODS word. By adding the NLT translation to give me a better understanding of some hard to read passages in the KJV. The cost was good and downloading was easy. I only use esword now as my bible, on my desktop and windows tablet and love being able to look up any translation instantly. Recently bought New Living Translation to give me another modern translation to help understand difficult passages. I Thoroughly recommend esword for a free bible software and you can add additional modules at very reasonable fees. Much cheaper than buying another bible. I don't normally use a dynamic equivalent translation version but I find myself going back to the NLT to see some key passages when reading the KJV or the ESV (main versions I use). For example, I the NLT translation of Philippians 4:6 than the ESV's. "Don't worry about anything; instead, pray about everything." The ESV says "do not be anxious about anything, but in everything by pray." I like the NLT reading more. I love how it makes it easier to understand the Bible. Since the NLT has become my “go to” translation, I was excited to have it available for use with the E-Sword app. The app gives me the ability to quickly and efficiently search the Bible using different translations. My next addition will be the NIV, although I am surprised at the higher cost associated with that acquisition. Simply put, the NLT offers a much more readable version of the Bible which is so smooth, yet very accurate. I recommend it for new Christians as a way to induce them into reading the Scriptures. I have often found myself using this version in my sermons, as it is very picturesque and easy to understand. I highly encourage others to have a copy on hand for a reference resource. Very useful translation for youth groups. I am using it much more than expected. I was needing this translation for my eSword as one in our Bible study group acquired a Bible with this translation and sometimes it was difficult to follow along so I just had to have it and it is so much better to read along with now. Having this product as part of my suit of Bible translations in my e-sword software package makes my study much easier and the ease with which I am able to navigate through the translation makes my studying process quite fascinating. I have truly fallen in love with this particular translation which I use more often for my personal devotion. Useful translation and a good addition to my E-Sword Bible grouping. Great for comparison purposes. The NLT is a great resource along with other translations offered by eSword. Thanks e-Sword for you very helpful Bible software package. I use it for the preparation of all my Bible studies and sermons. It is a great tool and so easy to use. The only way it could be better would be is if it would take my notes for me. This translation presents an easier to understand translation making exogenesis of scripture and use during bible study less difficult. Comparing different translations is just a click away, saving much time in not having to spend the time to find the same passage in another translation. Comparing different commentaries is also just a click away, and useful in understanding difficult passages. I have studied from the KJV in parallel with the NLT for years. Now, by having it on esword, I can find scriptures so much faster. The New Living Translation is accurate to the original and written in the language we speak today and helps give a clearly understanding to the reader. One example is Phil 4: 6-9. Read the KJV in parallel to the NLT and it will really come alive to you. Thank you esword - what a wonderful tool - a gift you have given to the world! I use the e-Sword system to respond to inmates that I do Bible studies with by mail all over the USA by way of and through "Crossroads Bible Institute" your system is very helpful in that I can use very easily the version the inmate is using and relate some better on an individual bases. and to have the commentaries so handy is so helpful; I do 5 lessons a week with a different inmate each lesson it is so neat to share the Bible with them in this way. Thank-you. I find the new living translation great it is in todays English and very easy to understand, great job! Well done! I find the new Living Translation so much easier to understand. We are studying Romans at the moment and it makes a big difference to be able to read it in todays English, Well done, keep up the good work. I noticed several people in my church using the NLT and seen the leader of my small group uses it so I decided to try it for myself. I really like the way it is written and also being able to use it in e-sword where I can compare it against the other versions I have makes it a plus. I have since bought a hard copy that I can carry with me to church. I usually like to fall back to the old standard KJV, but will probably be using the NLT now. This Bible is the same one Joel Osteen uses. I'm a "King James" version kinda guy, but the Living Translation Version lets me look at things with a "newer" frame of heart. Well Done. This is a new translation for me. I usually stick with NKJV, but I really like the New Living Translation (NLT). I, also, bought (hard copy) a one-year chronological NLT and a regular Bible in the NLT to have sitting next to me. I like the NLT because of its easiness of understanding the scriptures. It stays close to the Hebrew and doesn't wonder off into it's own way of thinking. This will certainly enhance your bible study and deepen your understanding of some of the stories you've heard all your life. Ultimately, it should draw you closer to God. e-Sword is a very valuable tool in my preaching toolbox. I am not sure I could ever be as efficient in preparing sermons as I am with this wonderful tool in my hands. The Word of God is vital to every believers life. e-Sword is a very easy Bible Product for preachers to use to give people the right food to eat. I cannot imagine not having e-Sword available. It would certainly make preparation time a longer process and loose out on the important elements of sermon preparation. Thank you e-Sword! You partner with many in their en-devour to feed people with the all important Word of God. New Living Translation is my favorite Bible choice after the King James Version. Now in e-sword I can have my two favorites side by side. This was well worth what I paid. I recommend this product. I use this bible for my Blog. It is very easy to read and matches with The Life Application New Testament Commentary that I use. e-Sword is my "go to" source for my bible study. It works on and offline which makes it useful anywhere I need it. It's affordable and very easy to use. This NLT is Red a letter edition. Good plain English a very accurate translation. Gave me a better understanding of the Word. Love it! This is a serious re-translation for serious bible students. Excellent, clear and breaks some new ground. The application is seamless and works perfectly in E-Sword. The NLT is another tool understanding God's word. It brings it alive in today's language. The more translations we use the more we may be able to understand the facet of biblical truth. E-sword made it easy to use it effectively. The New Living Translation is a good one for comparison because of the more modern and easily understood language. I am a fairly strong King James user, as are many Christians because it is considered to be the closest to the original languages; but I have completed an entire Study Bible in TNLT. I liked it, but found that it has a number of verses which have lost a bit of meaning in translation. In the original languages each word painted a picture that can hardly be expressed in a single word, nor verse of scripture in such clear English. While the former left an opening for The Holy Spirit to enlighten The Believer, TNLT presents the translators' idea or interpretation of the original meaning, leaving little room for obtaining God-Enlightened meaning as in the original. Even as "a picture paints a thousand words", with The Word in its original we could say " a word could paint a thousand ideas" or something the like. I believe that the more we modernize The Word of God, the more caution we need to take in not interjecting our own Kairos (at that moment) time meaning as being the absolute & only meaning. In short, The King James is still number one, and the New Living is a great comparison in specific instances where it expresses the meaning desired by The Lord within our own specific Kairos time. As for its value in E-Sword it appears to have been done well and presents speed in searching for specific words or verses during Bible reading or studying. Busy studying a certificate in Ministry and the NLT is very helpful and user friendly for quick finding of scriptures. I have used the NLT in a devotional setting and added it to my e-sword collection to use in sermon preparation, etc. It is a fantastic translation that I am using often. I love the Word and have several translations, but find that the the New Living Translation (NLT) has become my favorite to read and study. I'm grateful that e-sword had a downloadable version, to make my study and message writing faster. Now, I can copy and paste into notes and messages, instead of type them out. E-sword has a wonderful assortment of materials to work with, and I am thankful for the rich variety. The Bible version (NLT) I bought is just like the print/hardcover I own! This is so great because I will now move with my Bible right on my computer. Thanks God for e-Sword and its partners. I love the tool so much. I even just ordered the NIV also. Thanks for your great work eStudy Source. God bless you all as you serve him. Greetings in Christ! I had purchased the NLT for a main reason that I want to see "easy to understand" verses and I discovered nice addition to my personal Bible Studies. This translation is very helpful when there are some difficult verses to understand, then I will check others that I may understand more. With my personal conclusions from my studies, I would recommend this to anyone who have similar issues like me. Other than that, I have many pleasant but humble times with my Bible readings. May God smile upon you in Christ. I believe each of us is seeking to reflect "excellence" in our study of the word and excellence in the resources we use is absolutely necessary. As I have been obtaining eStudySource products for some time now, I have been impressed with the quality of the versions and products I have obtained. I know there are many Bible research products available on the market (and I have purchased many of them) but overall I have enjoyed the presentation of eStudySource products best for overall use. I highly recommend from my experience the products being offered here. It was easy to order and add the purchase to e-Sword on my desktop and to e-Sword HD on my iPad. e-Sword has become my go-to Bible for almost all of my studies. I have found this version the easiest for daily bible reading. I struggled keeping up with the NKJV but this translation had made it easy because of its simplified language. It also helps me see the story of the bible in a new and different light and adds much to my understanding of the scriptures. I highly recommend it! I work with the local jail ministry in dealing directly with the inmates in a group setting and also one on one. The New Living Translation is the most used version in the jail and I have used it on a weekly basis as I study and prepare for my time with the men and women in the jail system. Really enjoying this bible!! Being an inner-city pastor with a socio-economically mixed congregation, I find the NLT Bible to be the most "alive" translation of the Word yet! I am a fan of the ESV. However, because of the NLT's ability to clearly portray the greek and Hebrew in terms everyone can understand, it gets my "favorite translation" rating! I would recommend this bible to anyone. This is the first Bible I have found that translates Hebrew and Greek writings, including weights and measures into current US language. All other rigorous translators seem to believe that it is more holy to use ancient English and Hebrew and Greek weights and measures (words like cubit). I use this translation in e-sword to compare with four other translations and original texts to clarify or verify meanings of questionable translations. I have read through the complete translation and made many comparisons to others using e-sword. It is a pleasure to read and has provided insight into some Scriptures that other translations don't. I enjoy the readability of the NLT, have used e-sword for years to have them both in the same format is splendid. This Bible translation has been a good translation for the new believers. It has given them an easy understanding of the word, so as to allow their first understanding to be good. It has been a great first Bible! Great and easy as always! Every translation is a best judgment of the translators since no language is amenable to a clear “word for word” conversion. The NLT is an exceptional work since it faithfully captures “concept for concept.” I routinely use the NLT both for personal study and preparation of lessons. I use it often when creating handouts putting verses side by side with the NASB to providing a comparison when attempting to clarify verses more difficult in the NASB. It’s trustworthy and very readable. This is not so much about the New Living Translation as it is for E sword. The NLT pretty much speaks for itself and for me, the ability to turn on my computer and work with the Bible electronically is really special. The NLT is so easy to read and understand. While I love the poetic language of the King James Bible, it sometimes becomes a little foggy for me. I love this NLT version. E sword is the best thing that has ever happened to me in Bible study and Sermon preparation. I would recommend it to everyone. I am well pleased to have this New Living Translation in E-Sword ( and what a blessing E-Sword has been to us all ). The NLT is so easy to read and the understanding of Gods word is made clear. I also like the capitalising when referring to Jesus E.G. Him, He, His, etc. It is a sign of respect to our Saviour, ( I know, KJV only guys might get excited )But the understanding of what God requires of us in this translation can't be missed, even a child would understand. Surely that is good, God bless all who LOVE God's Word, Come Lord Jesus. I have a few translations ( ESV, KJV HCSB,CJB, NET)that I use for study and devotions but since "discovering" NLT & then NLT2ndEd I always come back to listening and reading from it especially devotions etc. Its like a breath of fresh air and I started seeing things that were so enlightening and new to me after 45 years of being saved. For deep study I like a translation with Strongs words attached like HCSB, KJV, NASB etc (which NLT cant have as its a balance of "thought for thought"and not just a word for word)but I always consult the NLT2ed first to get the gist of the meaning. I would recommend it to all people from young to old with different mental capabilities. All to often I find the KJV Bible to be confusing. I added the NKJV to my e-Sword software and found it to be a big help but I still needed more help in understanding some of the wording used. I decided to try the New Living Translation for e-Sword and I’m glad I did. Having a version that is translated into the language of the day and using wording I am familiar with has help increase my level of understanding. This translation really surprised me when I first read it. It is a very clear, readable translation, yet faithful to the original languages. It is very useful for bible study bringing "new" light to some of those hard to read passages. I just purchased and installed the NLT version for e-Sword and the installation was remarkably simple and seamless. Everything installed without the slightest difficulty and I highly recommend the process without reservation. My wife and I tried to find a parallel Bible with the NLT and ESV versions. We never could. But with this module within e-Sword the side by side is quick and easy to do. I also was excited to see that the same code would unlock the resource on my IPod with e-Sword LT. I have been using e-Sword for many years in my ministry with young adults at church. I have also made a few "e-Sword disciples" at church. It is great to have this module for E-sword, many people read this version and it is often a great comparison reference when studying. Love the ability to have easy access to the NLT on my iPhone. quick n easy look up a particular verse that you can share with others. Love it! I have been using both E-Sword software and the NLT for at least 5 years now. Both are excellent for my purposes. I have recently, later in life, changed my career field from small business management to healthcare chaplaincy. While earning my Masters of Theological Studies at Bethel College in Mishawaka, IN, and while completing 5 units of Clinical Pastoral Education, I used E-Sword extensively. I find it very to learn to use, work with, and utilize in very practical ways ... such as when preparing graduate papers, writing a teaching or sermon, doing word-search Bible studies, etc., etc. The NLT itself is a joy to use. The clarity of the language and its dynamic-equivanency approach to translation make it very useful in so many ways ... especially in these modern times when SO MANY people know very little about scripture and/or become easily frustrated by more formal, older language (KJV, NKJV, ESV, etc.). It is also very accurate and reliable (although not perfect ... no translation is). Three of the NLT translators also served as professors at my graduate school. I know these people personally, respect their integrity and their high regard for the Word of God, and am confident of their scholarship. Thank you, E-Sword and NLT Publishers for making my ministry and responsibilites as a chaplain much easiler and more effective. May God richly bless your ministries. I love this new translation. It is so easy to understand especially for the younger set. Thanks for making it available. This is a very interesting version. I get a lot of insights into Gods word through it. I have to remember that precision suffers because it is translated by phrases rather than literal word meanings. But, keeping that in mind, it really broadens my understanding. I love this translation, it's clear and accurate in modern English. For both new Christians and seasoned folks looking for fresh insights, the NLT is a great choice. While the Living Bible was for me a bit too far toward the paraphrase end of the translation continuum, the NLT manages to balance accuracy with easy readability. One of my favorite Scriptures is Ephesians 3:20, but in most translations it is part of a sentence that makes it awkward to quote. Blessedly, the NLT puts it in one sentence: "Now all glory to God, who is able, through His mighty power at work within us, to accomplish infinitely more than we might ask or think. As a first Bible for new Christians and as an alternate take on Scriptures for seasoned believers, the NLT is a great choice. Having the ability to check out the reading in e-Sword is all the more helpful. For e-Sword users, in addition to the versions available free, I would recommend purchasing the NASB, HCSB, NLT, and ESV. That should give you enough versions to help you get deeply into the Word. Anytime I can click rather than thumbing through several books at once I am satisfied. I've used eSword for a while now and I love what you offer. I do a lot of parallel study. Having the NLT electronically on hand in one location with my other versions is perfect for me. I use the NLT for a clearer understanding of certain passages of scripture, especially Paul. He majored in Philosophy right? Ah-ha! !--that's why he speaks so deeply! God bless you for what you have done and what you are doing. Very easy to read and improves my understanding of the context and meaning of Gods word. I read several different versions on a regular basis, but I keep coming back to the NLV. It seems easiest for me to understand. I'm not a scholar and I probably don't read the Bible enough but this is the version I prefer. Well NLT is what I needed to preach at several places I preach at such as the Rome and Utica rescue Mission, Teen Challenge, and various Churches as it's well translated to today's english. I prefer the King's James, but it's hard to understand for street people, or new comers to Christ. I will continue to use it as a tool as it has helped me plenty in the Ministry God has given me, as opposed to using my hand held Bible. For the Five Fold Ministry or any serious Bible student, the NLT translation is a must for everyone's Bible library. As a teacher of God's Word, I utilize the e-Sword Amplified, NLT, and King James (with Strong's numbers) daily to capture the full meaning of God's truths. The NLT is also the Bible of choice by my Bible Study group for its modern language and ease of understanding. I have had the hard copy, study version of this Bible since 1998 and it is my "read thru the Bible" Bible. The modern English it uses is SPOT ON when compared to the Hebrew and Greek, and is really easy to understand. I wanted the electronic version to help me with discipling and making presentations. I highly recommend it. This is a great resource. I was so excited to see the E-Sword had this translation. As I prepare for sermons or Bible study, I always like to reference the many different translations. Easy to read and understand. Highly recommend this. eSword and the NLT make a great combo. In preparing lessons for teens and adults the ease of use and information available is outstanding. An excellent dynamic translation. The NLT brings out many more subtle nuances of the ancient languages missed by more literal versions, making it an excellent tool for Bible study as well as for regular devotional reading. I was first pointed to the NLT about 10 years ago and have found it really good, specially for reading the Bible from cover to cover as it provides an easier to read translation. It has a better flow to be read in that way. This is a very good "pararhrase". Very usefull for people who may not be able to understand the more complicated "translations" of the Bible. I personally use the NASB version for my studies. The NLT is very usefull when explaining a verse to a new Chritian. I find it an excellent tool to study with and also compare the scriptures from one version with an other, I find I am going more for the NLT at this time,, thank you and congratulations, keep up the great work. Great addition to my library! Great product. We use it every day. Awesome translation and works perfect with esword, one of the best tools around to dig deep into God's word. What more could one ask for? It works, as advertised, seamlessly with e-sword. e-sword is the most intuitive piece of Bible Study software in existence today. The NLT's uncanny ability to make God's Word understandable and enriching is without comparison. Itried using the Modern King James Version (Free from e-sword) for years before buying the NLT Bible plugin. I now wish that I had of bought it the first week it was available. Get your copy today and reap the benefits of the best translation available. The New Living Translation has been nothing less than awesome in it's readability and vibrant communication of deeper insights from God's Word. It has been my constant companion ever since I bought it. My family are starting to appreciate it as well and are asking for their own copies. Thanks for bringing it to us! EXCELLENT!!!!! NLT brings the bible to life in plain english that reads like a story. So easy to understand. Very easy illustration of the greatest book on the planet. E-Sword has been a gift from Heaven. I like all the Bible Translations I can have in E-Sword. The New Living Translation is a (needed and helpful) translation. People who really want to study; need translations. It is sad to say, but some people try to down-play translations. If you don't like different translations you should change your mind. If you have a problem with changing your mind - try using them as Dictionary's. Useing translations can help all of us! I bought NLT, the NLT has a freshness about its language which is very refreshing. I was used to NKJV. I and later bought the NIV and NKJV, I love the parallel bible reading, as I spend time studying the Word the parallel bible really helps me understand, besides the commentaries and the dictionary are amazing. Thank you eStudySource and e-sword, I am blessed. Just learning the software,yet very user friendly!!! I find that my enjoyment of Scripture has risen since being updated to the New Living Translation. I think that since the KJV the NLT is the best translation I have come across and it's easy to read and understand. I now can enjoy it also on the computer as well as the hard copy that I have. I would love it to come out in a wide margin version to so I can write notes in it! Just as well the computer and esword have good note areas! I love this translation for it's easy and engaging reading style! It sheds new light on difficult-to-understand KJV passages. Makes Bible reading and study very enjoyable, and adds insight to many passages! I absolutely love the NLT translation. 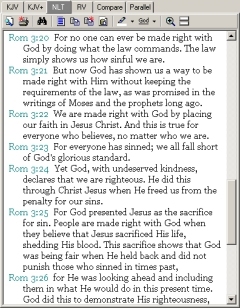 Having it as part of my favorite Bible software, e-Sword, is fantastic. It makes Bible study so much easier. I would *love* to see a version with Strong's Numbers. I highly recommend this purchase. A+! This bible is the easiest one I have read! It stays close to the NKJV but it makes the understanding very simple in more of today's words. I have this version on CD and I read and listen to it together and talk about "knowing what God is saying" the two of these really gives it to you! Thank you eStudySource for your wonderful products! Love the NLT for studying and reading! This goes with eSword which is the best bible study on comp. that I have found. I pretty much only use my KJV for personal devotions but have found it goes completely over the head of my youth group disciples and the college kids in my Sunday School class. Because of that I have begun to use my NIV which is not bad but still doesn't have the same poetic writing as the KJV. I have loved the Living Bible since it first came out shortly after I was saved. I've had it in Hard back for years but it's really great to have it right here with the other translations. It makes study, preparation and devotions much easier. I love e-Sword. I have used PC Bible software for many years as a part of my church and teaching ministry. E-sword has become my main study tool because of the way that the desktop enhances the comparison of different key Bible translations, together with recognized Bible commentators and dictionaries. The NLT translation is quickly being recognized for its accuracy as a tool that enables the student of God's Word to be better equipped and informed. E-sword is now my Bible software of choice in all of my teaching and lecturing, and I have been able to alert my students to its many features as well. This translation is a highly readable and yet accurate translation. While it is especially suited for new believers, it gives a fresh look at the scriptures to those who have been Christians for a long time. I'm very happy with the NLT translation for e-sword study. Thanks, I'd gladly recommend it to anyone. Easiy one of the best and most accuate parphrased bible translations. Very helpful to understand ambiguous passages. This is am amazing version; but I would like to have it in Spanish also. Much of the Spanish people are prefering this one. May the Lord bless all of your. A good translation in modern language for easy reference. And it is made effective and efficient by electronic software. I first began reading the NLT in a One Year Bible and it was like a light bulb went off to reveal God's Word more clearly. When doing 'homework' for the studies I'm involved in, it is great to have the version that the teacher uses (usually NKJV) and the NLT available to clarify those passages that stump me. Many times it expands the meaning and opens up additional areas to study. When I switched to Win 7 (new computer) my old Bible program no longer worked. Looked at Quickverse and others. e-Sword is the best I have seen. The NLT is superb used with the e-Sword resources greatly assists me with the study course my wife and I are busy with. We are doing a survey course of the whole Bible and find enormous help using the cross references available to us on e-Sword. I never would have discovered the joys of a New Living Translation Bible, if it wouldn't have been for the eSword module. Reading the NLT Study Bible is like reading the Bible for the first time, or getting a Bible of your own in your own language after being taught from a Bible in a different language your whole life. The NLT folks have a motto on their website, "The Truth Made Clear" Ya, that's it; I couldn't have said it better myself! The reading and studying in the NLT has been a real blessing. I can say that it has really made a difference in my life. I have a better understanding of God and a better understanding of how God looks at me (and what He sees!). My wife does a daily Bible study with the kids and part of that is from the NLT. It has really done wonderful things for the kids and their understanding of the Word. In the area of "dynamic equivalent" English translations of the biblical manuscripts, the New Living Translation is undoubtedly the very best, and the truest to the essence of the original text. A great tool for all Bible students. I love the NLT. It's the easiest-to-read translation I know of!!! Like all translations, it has its problems -- let's face it, a translation can never equal the original text -- but the NLT is my favorite of all the translations and/or versions out there. I always back it up with other translations (like Young's Literal Translation) or versions (like King James, which I grew up on but is a bit more difficult to read); but I prefer to start with the NLT and then double check for accuracy/agreement with other texts. I want to learn Hebrew and Greek in order to study the original texts; but until that happens, I prefer to use the NLT. For the price you can't beat the esword modules. This one has worked just like it should. I love the way the NLT makes the authorial intent clear. If you like the NLT you'll love this module.